Hi everyone! It's been quite a while since I was active here. I have a Suppo B2208/14 1450KV motor and was wondering if it would be able to handle a Simple Scout well? I want to try this hobby again now that I have a bit more money available. I actually already built and flew it once, but I really struggled to keep it in the air, although thinking back I may have gotten a bit excited to fly it and should have waited for another day because it was decently windy, IIRC. 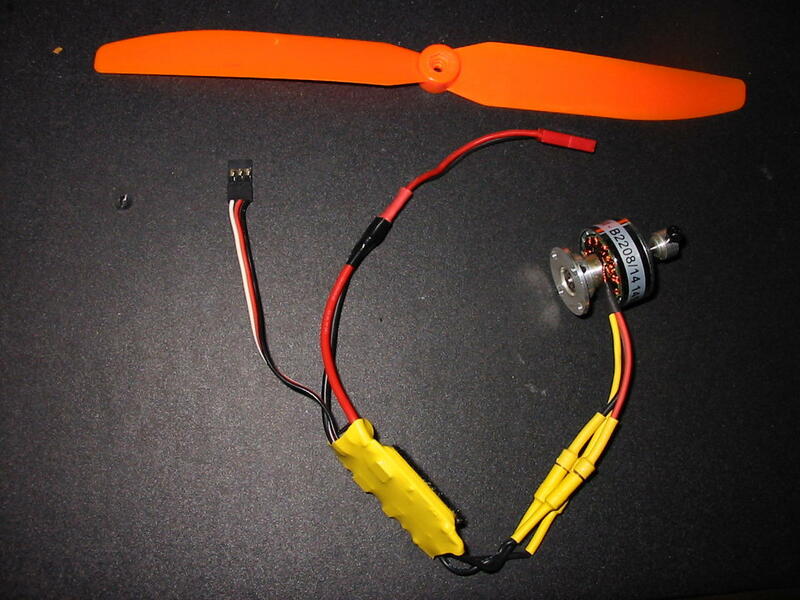 I have a 3S battery and a 9x5 prop (same prop and motor in this picture I found) and before I try and fly it again I was wondering if this motor and prop combo should theoretically be enough for a simple scout? If not is there a prop that I should get for this plane or should I be looking at a different plane altogether? Loops were lazy affairs and needed some altitude. So, I’m thinking you are probably a bit underpowered with a 2208. No gear, I might just take the motor out of it and build something smaller with it and throw a bigger motor and stuff in the scout later. Any suggestions for it? I was actually thinking of where it might be a good fit. There’s some of the earlier designs that I haven’t built yet (old fogey as an example...) that might be a good fit. I almost want to suggest a goblin.... but I’ve built three... no, four and have yet to go through a full battery in one. I think anything that is listed for a “B” pack would be a good choice. Would this be too much for one of the mini series planes? I should add I'm looking for a somewhat easy flyer. Let’s talk about your scout build, is it dollar tree Foamboard? FT Waterproof Foam, I would say a regular amount of glue. What condition is your battery? No but the battery was has been barely used (less than 20 cycles) and when it was used it was discharged to very safe amounts. Maybe someone can chime in who’s flown the simple scout on a b pack motor. One thing not mentioned is the weight of it, little extra glue, the heavier the plane the more power required. Alright well I'll try taking it out for one more spin when it's less windy and I'll report back. Thanks guys! The Simple Scout will be tight on weight. If you could weigh the model we'd be able to help better. Technically the motor specs say it can push anything between 200-500g of thrust. It could work but will be underpowered for sure. There are a lot of other models you can build to work with that motor, check out this file might help you get an understanding of what models can work for that motor. I test a lot of different motor, prop and esc combos with my thrust stand so I can see exactly what I am getting with each combo. Props, motors even being the identical size or pitch don't deliver the same results . A simple easy test I do anyways once everything is in is a simple vertical thrust test, by 1/2 throttle or so that plane should be trying to lift out of your hand, full almost jumping out of your hand. If you have to go to full throttle for lift it will probably fly but just barely and don't try to go against the wind as you will lose and simply running at WOT the whole flight you are more then likely going to burn something up. I don't think that you can compare that motor with the FT B pack motor. The 2208 1450kv motor on a 3s motor is recommended with a 7x6 prop and only puts out about 400grams of thrust. If your planes auw is 500+ you might have issues flying, especially in the wind. The FliteTest B pack motor is MUCH more powerful, on 3s with a 10" prop it can push 1000grams of thrust. Even the old FT B pack motor would push 750-800 grams on 3s. I would recommend this motor on simple planes like the FT flyer/nutball/delta but that's about it. Maybe smaller builds like the Tiny Trainer or Old fogey. But be careful on the old fogey, it likes bigger 8" slowfly props pushing lots of air over it's tail. Anyway, power wise, that motor is more comparable to the A pack motor. BUT, i wouldnt recommend using it on planes that use the A or F packs. They swing smaller 5-6" props. If you put a bigger prop on the mini planes you'll have torque roll issues. When your throttle up it'll pull hard to the left. The bigger the prop, the more torque roll you'll have. Anyway, do your research. If you wanna fly the full size scout, or any of the full size swappables for that matter, look for motors that use 8-10" props that will put out at least 600-800 grams of thrust. 200watts roughly or more to have an enjoyable flight. 800-1000+ grams of thrust will give you unlimited vertical and loads of performance. Like the actual B pack motor. Long story short, your motor is too small to fly the normal full size swappables like your scout. Good luck with the hobby. If you need help choosing a motor/prop/esc let us know. There are plenty around here that would be glad to help. Yeah I tried the vertical test up there and no dice. Ill probably take out the motor and stuff and put in in a smaller plane. Any suggestions for a mini I should try? That's the easiest thing to try especially if you don't have a thrust stand plus even if you wanted to experiment with different props brands and pitches it is a simple test. But, with different props you should get a watt meter so you can see how many amps and watts you are drawing so you know if you have to upgrade the esc or even the C rating on the battery. Like I stated above, most of your FT minis won't fly very well with a 7-8" prop. It will have too much torque and want to roll on you when you hit the throttle. More so at launch. You may be able to make it work on the Tiny Trainer. Keep it as light as you can and it should fly decent. The Tiny Trainer has a decent wing span for a mini so you shouldnt have as much of an issue with the torque roll. Or you can try the FT flyer/nutball/delta. Those three use the regular swappable pod but are much smaller/lighter than any of the other swappables. If not I'll go with the delta.